It is time once again for some new equipment. As a runner I have to say I love new equipment. I have been putting off for too long replacing my shoes and once again I found myself nearing the 500 mile mark and starting to feel the strange pains brought on by very tired shoes. I knew it was time for new shoes, but also knew that both of my daughters were in need of new shoes and I just couldn't bring myself to buy myself a new pair before I first took care of them. (I have so much to say about my two daughters and track, but I have to save that for another long overdue post) We finally took care of their needs and so I started looking frantically for my next pair of shoes. My shoes have been discontinued by New Balance, but I am really happy so I really wanted to stick with the same pair if I could. Everyone was sold out, but I luckily found my model in my size on clearance at New Balance Web Express. The next time I am in the market I will need to change shoes..... oh the horror! I went out today with my oldest daughter Ashlee in my new shoes..... oh how nice to run in new shoes :) I also took my new watch for one last test drive before telling you about it. 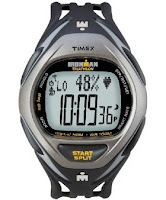 I was sent a Timex Ironman Race Trainer and had some trouble giving it a good "run" before now. I got out and ran without too much issue during this cold winter we had, but with the brutal cold the last thing on my mind was trying anything new. This heart rate monitor is for passionate athletes in training. It's technologically advanced, but super easy to use. The Race Trainer boasts a 10-workout memory that saves workouts with date and time, as well as a 50-lap chronograph. It captures a variety of useful fitness info including peak/avg heart rate and calories burned, and users can wirelessly download their workout results to their computers and keep customized training journals, if desired. The product includes a wristwatch, heart rate chest sensor and USB device for the downloadable function. Available in two men’s and two women’s styles. When I first took it out of the box I have to admit I was a little bit overwhelmed. I have a bit of a short attention span when it comes to setting up new equipment like this. I just want to get out the door and start trying it out. It took me about 15 minutes to read through the basic setup instructions and get it connected to the heart rate strap. This wasn't any worse or better than the last heart rate monitor watch I had when I set it up. Once I had the chance to go running with it I did notice it was very easy to connect with the heart rate strap. I cannot say the same for the previous heart rate monitor watch that I had. It is very comfortable to wear, and I don't even notice the strap once I get running. The watch is easy to use while on the road running, but I don't find myself doing too much analyzing or adjusting while on the run..... with any watch. It took me a few minutes to figure out how to read the results when I got back from my run, but once I figured it out it really wasn't bad. This watch has a lot to offer as far as stats, but I don't use too much other than the basics. I really was bummed when I found that I wasn't going to be able to give this watch a complete review. When I took everything out of the box the USB Connector was missing. This means that all I could test and use was the watch itself, and couldn't connect it to my computer or test any of the functionality with the software. All in all I found this watch easy to use, comfortable, and easily living up to the Timex name. I would recommend it for anybody that wanted a watch without GPS capability...... but for me, I really have grown spoiled with running with GPS capability and the freedom that gives. There are times when I don't need the GPS capability and for those times this will most certainly be my go to watch. In my package I was also given the opportunity to try out some products that I really didn't know existed. I have heard of EAS products, but really only thought of them with their ready to mix protein shakes and nothing more. 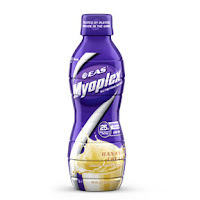 I was sent the EAS Myoplex Nutrition Shake. This was a ready to drink shake and was very convenient and tasty. The flavor I was sent (Banana Cream) would not be one I would ever buy, but was actually very good and smooth. The other EAS product was one that I would buy again without any hesitation. It was the EAS Myoplex Nutrition Bar, and a very yummy Chocolate Mint flavor. Both of these products brought a lot of protein and didn't lack in flavor to bring the protein. I have tried a lot of protein products over the years and many of them are just down right disgusting..... not these products from EAS. I'm impressed you can get 500 miles out of one pair of shoes. At my weight, 300 miles seems to be the max. Love the Mizuno Creations & Waves. Getting close to 500 miles is out of necessity. They usually start hurting me about 350..... I just stubbornly push forward until I can't go any further. i try to squeeze out 500 mi too, but if a pair is just being cruddy i change 'em out early. Shoe changes drive me nuts also! I can usually get close to 400 miles out of a pair before I retire them. I agree with you about the GPS's. I have been using one for about a year and don't know what I would do without it now. Thanks for the NB tip...they just discontinued mine and I don't like the "upgrade!" Hi, I just stumbled across your blog, and it's great! I also was overweight and lost a lot of weight through running. I just discovered my love for races, though, this past September and just finished my first marathon (Disney World) in January! Congrats on your accomplishments! don't quit and also keep creating because it simply worth to look through it. WOW! I just started running last week and came upon your blog today. It's amazing how far you have come - I need to lose 50 lbs and hope that running will help. Thanks for posting your story!